The latest budget was a very significant step in making the working class pay for the crisis. And it has been announced with great care to delay, divide and divert any resistance to it. This was chancellor George Osborne's "unavoidable budget", necessary to pay "the debts of a failed past... The richest paying the most and the vulnerable protected." His coalition partner, Vince Cable backed him up: "The cuts in spending and the increases in tax will be felt by everyone, resented by some but understood, I think, by most" (Guardian 23.6.10). It's not as if we weren't warned that it would be painful in advance. But one thing this budget is not is progressive, the vulnerable are not being protected. On the contrary the working class - the source of profit in capitalism - will have to pay. All workers will have to pay the increase in VAT to 20% from next year, increasing inflation and lowering real wages, a measure that hits the poorest hardest, despite zero rating on food etc, since they have to spend the greatest proportion of their income on necessities. Public sector pay is being frozen for those earning more than £21,000, a pay cut when inflation is taken into account. Even the £250 flat rate rise for those earning less is a cut in real pay. The previous Labour budget envisaged taking 4% of GDP out of public finances over several years, two thirds of it from spending cuts. The new budget will increase this to 6.3%, three quarters of it from spending cuts yet to be announced. With the NHS apparently ring-fenced, this will amount to 25% of budgets on things like housing and transport, while they have promised to go easy on education and defence. This is an across the board attack on the whole working class. 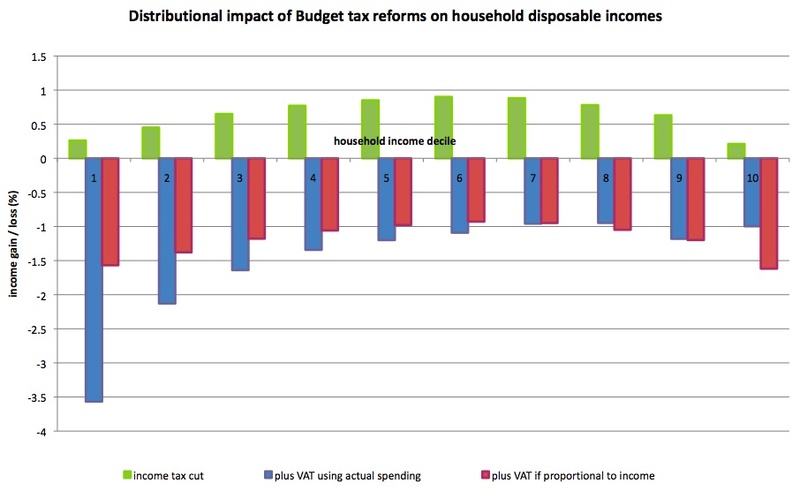 A briefing for UNISON and the TUC (‘Don't forget the spending cuts') has estimated that this is equivalent to a cut of 21.7% from the income of the poorest tenth of households and over 5% for the middle quintile in 2012-13. This is the money these households would need to find to replace the services they have lost - but of course they will not be able to afford it and the real cost will be paid in deteriorating housing, education, infrastructure... with irreparable effects on quality of life, health, and ultimately life expectancy. A study by Stuckler, an Oxford University epidemiologist, has found each cut in welfare spending of £80 per person will increase alcohol related deaths 2.8% and cardiovascular deaths by 1.2%, and the budget cuts are likely to lead to between 6,500 and 38,000 deaths in 10 years (Guardian 25.6.10). For those in the public sector it will mean not just a ‘pay freeze' but also job losses: 500,000 to 600,000 over the next 5 years according to a private Treasury estimate, 725,000 according to the Chartered Institute for Personnel and Development. The private sector will also suffer to the tune of 600,000 to 700,000 job losses according to the Treasury estimate due to the loss of government contracts (Guardian 29.6.10). As for the chancellor's claim that the private sector will create 2.5 million new jobs - as John Philpott, chief economist at the CIPD, said, "There is not a hope in hell's chance of this happening". For all the new government is boasting about its honesty, not hiding anything in the small print as the last Labour budget did, we have to wait for the spending review in October to hear what is being cut and who is losing their jobs. In the meantime we hear lots about the pampered public sector and its unaffordable pensions, with former Labour secretary of state John Hutton brought in to examine how best to cut this cost. But as we can see, public sector cuts are attacks on the whole working class and not just those who work in it. As for pensions, this is not particular to this or that industry nor to public or private sector, since everyone faces the same attacks sooner or later, and the rise in the state pension age already announced by the last government is being accelerated. And, of course, the new government wants to help people caught in the poverty trap of state benefits ... by cutting benefits. Just like the ‘hand up not hand out' and the new deal brought in by Blair and Brown, this measure aims to prevent workers being stuck on benefits when they could be forced into jobs on poverty wages. All benefits apart from the state pension will be linked to the Consumer Price Index instead of the Retail Price Index, which is likely to save £6bn over the next few years. Medical checks for people on disability living allowance and incapacity will be further tightened. Housing benefit is being limited. Nor should we fall for any notion that this is just about the unemployed and disabled, people the government and media can imply are scroungers - child benefit is frozen, maternity grants being completely cut, affecting families whether or not they work. Cuts in welfare spending are due to save £11bn in 2014-15, or about a third of the extra spending cuts. The Liberal Democrats may be very pleased with themselves over the nearly £1000 increase in tax allowances, but this nowhere near makes up for what has been taken away. 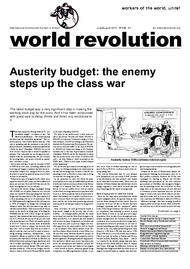 When even the Institute of Fiscal Studies has labelled last week's budget ‘regressive', there can be no doubt that this is an attack against the whole working class. Gone are the days when politicians and media waxed indignant about the greedy bankers who took the blame during the credit crunch. Now our economic woes are all due to Gordon Brown's profligate spending and the pampered private sector. Then the government, like those in all major economies, was pumping in money to prop up the banks in order to try and prevent a major depression. Now we have been through and technically emerged from the recession, and the government is more concerned about sovereign debt, epitomised by Greece's problems, so it's time to cut state spending and raise taxes even at the risk of a fall in the very small predicted growth rates (down to 1.2% from 1.3% this year and to 2.3% from 2.6% next) or even of a double dip recession. This is not just the policy in Britain and Greece but also Ireland, Rumania, Italy, Spain ... and so on. Luckily for the British ruling class they have held an election which makes it easier to explain this U-turn. Although the difference between the Darling's last budget and Osborne's first is one of degree, we should make no mistake that this budget is a major step in attacks on working class jobs and living standards. Despite all the talk of Thatcherism, despite the government blaming its predecessor, there is, in fact, perfect continuity between the £11bn cuts envisaged by Darling in March, the £6.24bn spending cuts announced by the new coalition government on 24th May, this emergency budget, and the spending review due in October. At each stage there is the announcement of new cuts and a reiteration of how important they are. At each stage we hear a little more about what we are facing, about what will be in store in a few months time. Last year the NHS had to make £15-20bn in ‘efficiency savings', this time housing benefit is capped, public sector pay frozen, while in October we will hear more about which workers will lose their jobs. It is so much easier to avoid, or at least delay, struggles against these draconian measures when they are announced a little at a time. Blaming the last government and public sector spending has another, more important, advantage - an excuse to try and create divisions between private and public sector workers. The campaigns about immigration play the same divisive role. If there aren't enough jobs, houses, school places then they will cap immigration. This is doubly dishonest, since one of the reasons immigration increases is that the crisis is world-wide, workers are forced to travel to earn a living because there aren't enough jobs anywhere, whether or not there is any immigration. Secondly most immigration is from the EU and cannot be capped, and the campaign is all for show, all to create divisions, to weaken working class struggle. This budget is a major effort to take money away from the working class as a whole, firstly from the social wage and benefits, but also directly from public sector pay and in the coming months through job losses. And none of these effects will be confined to the public sector as less public money is pumped in to buoy up the economy. It is being carried out by the government, not just because they are right wing Tories, but on behalf of the British capitalist class as a whole. There is no question of workers being "in it together" with them: we are in a class war. Harriet Harman may criticise "a Tory budget that will throw people out of work" or David Milliband characterise it as "give with one hand, punch with the other" - this is the opposition's job. But we only have to look at the last 13 years, or the Labour governments of the 60s and 70s, to see that when in power they do exactly what is required in the national interest, ie the capitalist interest. We cannot trust them to help us resist these attacks. Above all, these are attacks on the whole working class and we must see that no section of the working class can succeed if they struggle alone.